Scoliosis is a lateral curvature (side-bending) of the spine. A single curve in the spine is described as a C-curve. If the spine curves in both directions, it is described as an S-curve. 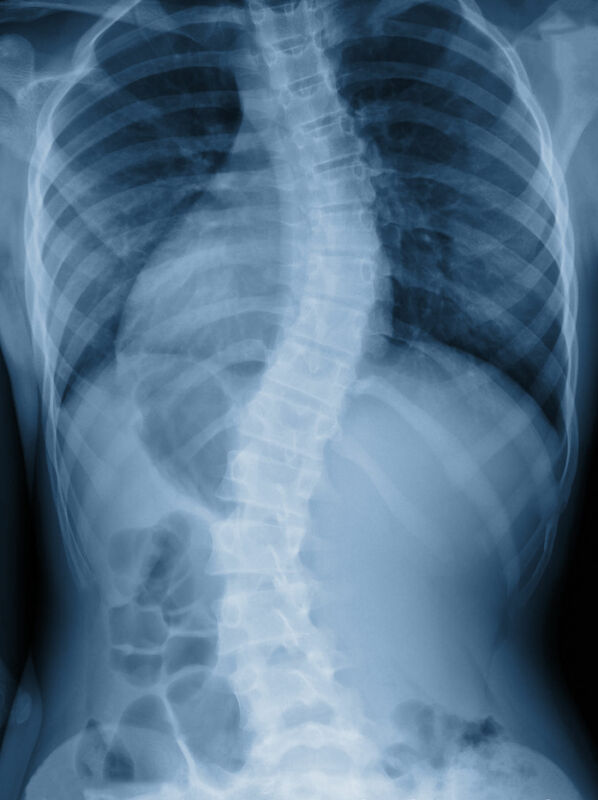 If the degree of curvature is eleven degrees or more, it will be diagnosed as scoliosis. Approximately 80% of scoliosis cases are classified as idiopathic,1 which means that the cause of the spinal curvature is unknown. In cases of congenital scoliosis, the spinal curvature is a structural abnormality that is present at birth. In cases of neuromuscular scoliosis, the spinal curvature is caused by a neurological or muscular disease, such as cerebral palsy, spinal cord trauma, muscular dystrophy, spinal muscular atrophy, spina bifida, neurofibromatosis, or Marfan syndrome. Roughly two-thirds of adults with scoliotic curves between 20 and 55 degrees experience back pain.1 Many people with scoliosis develop pain in other parts of their bodies due to their postural misalignment, which puts uneven stress on the hips, knees, neck, and shoulders. Arthritis, disc and nerve compression in the spine, and difficulty breathing are also common. 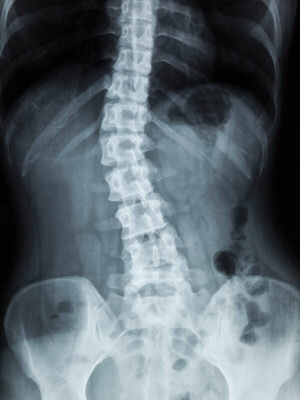 The vast majority of people with untreated scoliosis, as well as some who have been surgically treated, develop spondylosis.1 Spondylosis is an arthritic condition of the spine in which joints become inflamed, cartilage thins, and bone spurs develop. Disc degeneration or spinal curvature can lead to spinal vertebrae pressing on nerves, resulting in severe pain and requiring surgery. Typically, bracing is recommended for curves that are greater than 25 degrees. Bracing attempts to slow or halt curve progression by forcibly aligning the spine. However, studies show mixed results when it comes to the efficacy of bracing,2,3,4 and some experts believe that the practice of bracing is outdated and ineffective. Patients who wear braces can also experience negative side effects such as pain, restricted breathing, and weakening or stiffening of the muscles due to lack of movement. Rates of complications in spinal fusion surgeries vary, but are quite high across the board. Some research has shown that more than half of the surgeries are unsuccessful, meaning that the vertebrae do not actually fuse. Even though the vertebrae are held in place by hardware, patterns of contraction in the back muscles cause micromovements in the spine, preventing continuous growth of the bone. Muscular contraction can be so strong that the metal rods that are inserted along the spine actually break, causing a great deal of pain and requiring repeat surgery. Given the high risk of complications and the lack of evidence supporting spinal fusion as an effective treatment, many doctors and researchers now agree that the surgery can be used to slow or halt progression of the curvature, but little else. Many cases of idiopathic scoliosis are caused by chronic muscular contraction pulling the spine out of alignment. If you have scoliosis, you can touch your back and waist and feel how tight the muscles are. While many people have tight muscles that pull their spine out of alignment, the degree of their curvature is less than 10 degrees, so they don’t get diagnosed with scoliosis. However, they may experience pain and other issues because of their small degree of curvature. Between two and five percent of teenagers are diagnosed with scoliosis. By age forty, that percentage goes up to eight percent. Then by the time we get to age sixty, somewhere between 35 and 68 percent of adults meet the criteria for scoliosis.8,9 The fact that scoliosis becomes more prevalent with age is a strong indicator that our learned muscular patterns, the effects of which increase over time, play a role in developing the condition. Chronic, involuntary contraction of the muscles along the spine can result from injury, chronic pain, emotional stress, repetitive activities, and even handedness. When we have a protective reaction to an injury, or if we repeat certain postures or movements over and over, our nervous system learns to keep certain muscles tight, and we lose the ability to voluntarily relax them. This is one of the negative effects of developing muscle memory. While muscle memory allows us to perform daily tasks efficiently and improves athletic performance, it also allows us to sink deeper and deeper into dysfunctional muscular patterns and do damage to the physical structure of our bodies. A spinal curve caused by tight muscles pulling the spine out of alignment is a functional issue; it is caused by the way the nervous system is functioning. Attempting to improve a functional spinal curve by using manual force is nonsensical and most often ineffective. Using a brace or metal rods to force the spine into alignment has little to no effect on the messages that the nervous system is sending to the muscles to contract. The most effective treatment for most idiopathic scoliosis patients is active, conscious movement that gently releases the chronic muscular contraction in the torso. A lasting release of chronic muscular contraction can only be achieved through active, conscious movement that engages the nervous system in a learning process. Thomas Hanna developed a highly effective movement technique called pandiculation. Pandiculation releases subconsciously held muscular contraction and brings muscles back into voluntary control. Hanna incorporated the technique of pandiculation into his system of neuromuscular education called Clinical Somatic Education. People who use Clinical Somatics exercises to release the chronic muscular contraction that is causing their curvature typically experience reduction or elimination of their pain as well as gradual straightening of their spine. The exercises are very slow, gentle, and therapeutic, and are appropriate for all ages and fitness levels. For most people, idiopathic scoliosis does not have to be a life sentence. The earlier the condition can be addressed with neuromuscular education, the better. Years of pain and psychological suffering can be prevented with early, constructive intervention.